“In Greece, Bulgaria and Cyprus there is almost universal agreement that corruption is a national problem” says damning EU Commission report. CRIME, corruption and the crisis have topped the list of Cypriots’ concerns with a staggering 94 percent of respondents believing that corruption is widespread in the police and the wider public sector. The EU average in the same category was 78%, according to the EU’s latest Eurobarometer. Asked how this corruption manifested, 54% of Cypriots agreed that many appointments in public administration were not attained through merit. Many also felt the following; that corruption was a daily part of life where 30% was in agreement. Some 40% believe laws were not being enforced, while 43% think there is no real punishment for the lack of enforcement. Around 45% think politicians are not doing enough to fight corruption. Asked about the giving and taking of bribes and the abuse of power for personal gain in various sectors, Cypriot perception that they were widespread was consistently higher than the EU average. In the case of the police, customs, public health and education service, the percentage of Cypriots that belief in widespread corruption was twice the EU average. Curiously, Cypriots did feel that public spending was done in a more transparent way than the average EU citizen, which suggests that it is the people appointed to spend, not where the money goes that is the main concern. Another curious result regarding public trust is that Cypriots place equal trust in the press as they do the EU, while 70% mistrust NATO. Regarding the global crisis, 43% of respondents said that the current economic situation was their main concern, and that the worst was yet to come said 76%. This was followed by 36% who said crime was their main concern. 31% said unemployment and 26% rising prices. The EU-27 wide poll also listed “Other Problems” as a category of concern, which 18% of respondents chose (the largest response in the EU-27) Since the Cyprus problem was not an option in the poll, it is likely that most of the 18% meant this. Just one in four respondents said that things in general were moving in the right direction, and less than one in five believed today’s children will have an easier life. 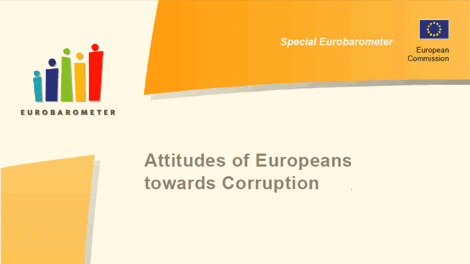 Download the Eurobarometer factsheet on Cypriot attitude towards corruption. Download a summary of the Eurobarometer special survey report on corruption. Download the full Eurobarometer special survey report on corruption. We are part of a group of people whom have been scammed by an agent in the UK, who colluded with developers, well known estate agents and solicitors in Cyprus. One of the main Cypriot banks then joined in. We thought we had a solicitor in this country who could sort it all out, Cypriot of course, let down again more money for absolutely nothing and including being conned into sending money again to Cyprus to a “well respected surveyor” who drained out the last drops of our fighting fund and did not do the work. When we asked for our money back he refused and threatened us ! Nobody will help us, the Cypriot courts are at best inefficient and worst corrupt. I and at least a hundred like us are at our wits end some have lost their homes, others close to it. How could such a corrupt and tribal country be allowed to join the EU ? The UK Government should step in and assist its citizens. There seems to be only one politician even mentioning this massive scam in Parliament. The fraud squad are seemingly only just waking up to it, but are being slow to react against the perpetrators in this country as they see it as an investors problem. Well its not most of the victims are just ordinary people. There is just no way out when every sector of society in Cyprus is corrupt and unregulated. Can anybody help us ? WE SHOULD ALL REGISTER WITH THE CYPRUS PROPERTY ACTION GROUP AND AT LEAST THIS COULD BEGIN TO DEMONSTRATE THE SIZE OF THE PROBLEM. We know of almost a hundred victims. We need a way of getting together and lobbying Parliament . But what is the EU going to do about it..? Greg Gregory got it about right. Cyprus is amateur at corruption, UK is professional – a bit like football fouls really! The swine flue scam has now been shown for what it is and I’m glad I sold my Glaxo shares at the top of the market. Is there any wonder why we G/C’s love the UK so much – we have so much to learn! The level of corruption which is rife in Cyprus regarding Lawyers and Developers, and indeed the Courts, needs serious action. Hundreds of people are losing their life savings to these crooks. When is the EU going to actually do something? What about the total corruption from the salesman to the developer to the solicitor and then banks and to the government in Cyprus do a poll on that to all EU members not just Cypriots in Cyprus you will see a big percentage that have lost everything or are going too because the system is so corrupt no one can get answers or situations resolved their is no one or no where to go everyone’s hands are tied. It is all about pay first and nothing will be done after from anyone. Where is the EU help for people like us and who do we seek help from in the EU? Especially when you have no more money to fight as this corrupt island with many others have taken your every penny. Help who do we turn to and I speak on behalf of many. The power of nepotism. With such a small, closely knit population I can’t see anything changing. Seems like to scandal over the BAE arms deal with Saudi Arabia and the MP’s expenses, to name just a couple, seem to dwarf the scale of corruption in Cyprus. Oh, nearly forgot, Margaret Thatchers son was involved in some corrupt arms deal when she was in power! Sounds just like the U.K in every aspect of this article. The difference is with Cyprus it is so obvious whereas in the U.K it is all shrouded and glossed over with other distractions and is not IMMEDIATELY apparent.